Summer Crush is so fresh and airy. It features Caroline's Collection from the Elm Creek Quilts Collection by Jennifer Chiaverini for Red Rooster Fabrics. Soft violet, green, and pink are paired with a torn bleached muslin ruffle for a lovely summer quilt. 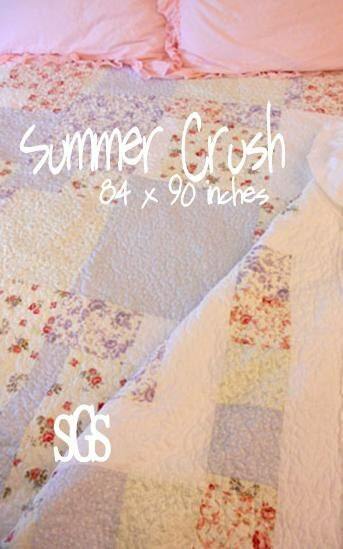 Summer Crush measures 84 x 90 inches not including the 4 inch ruffle. Summer Crush is a pattern perfect for the beginner/beginner advanced. The ruffle can be made by gathering the strips or by using a ruffle sewing machine attachment...or forgo the ruffle. Ruffle is only on the sides and the bottom. Summer Crush was quilted by April Zimmer using an overlapping, tight meander (crackling) in white thread. Summer Crush was designed by Mickey Zimmer for Sweetwater Cotton Shoppe. A+++. Thank you! One of the BEST shops. Very Professional, Talented and Prompt! One of my favorite shops!